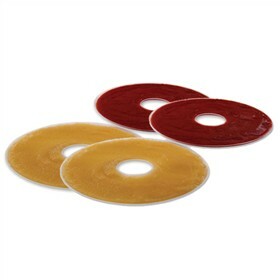 The Nesco LSS-2-6 fruit roll sheet is great for making fruit rolls for the kids. This sheet is used to fit with Nesco FD-28JX, 37,39, 60, 61, 75PR food dehydrator. The sheet features a no-spill outer lip to keep liquid content on the tray allowing custom thickness. Each tray holds 3 cups of liquid or fruit puree. The Nesco LSS-2-6 has many exciting features for users of all types. You can extend the lifetime of your Nesco LSS-2-6 with the purchase of a FactoryOutletStore Factory Protection Plan. See the Nesco LSS-2-6 gallery images above for more product views. The Nesco LSS-2-6 is sold as a Brand New Unopened Item.